Harvey and his colleagues exercised their (c)(3) lobbying rights by completing a full swing of Capitol Hill lobbing in Washington, including throwing a bash at Tortilla Coast for congressional staff. He says that they attracted something of an equal split of Democrats and Republicans. Harvey claims that he wasn’t lobbying for money, so what else was he looking for? Perhaps it is the fact that the Department of Interior’s Bureau of Land Management (BLM), which oversees the federal land where Burning Man is held, recently placed the festival on probation for exceeding the BLM’s 50,000 person crowd limit. 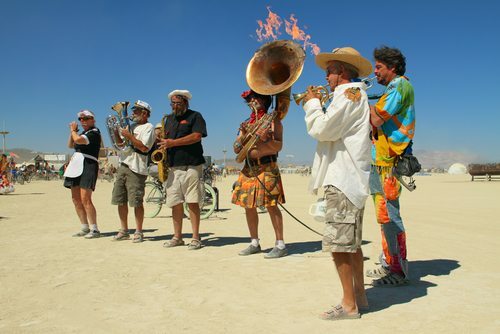 In 2011, Burning Man exceeded the crowd limit by 4,000, and is now asking for a revised crowd limit of 58,000. The Burning Man argument is that its violation of last year’s crowd limit should be ignored and it should get a new permit for 58,000—to increase to 70,000 over the next five years. The 50,000 cap was set in 2006. For its part, the BLM cited problems of traffic, air quality, and garbage as concerns about the festival, which sold out for the first time in 2011.